So this morning I was sitting at a stop light on my way to work, half in a daze, when I noticed the car in front of me had a bumper sticker. At first glance, I assumed it said vegetarian. So immediately, I thought to myself, who cares if you’re a vegetarian…not me. 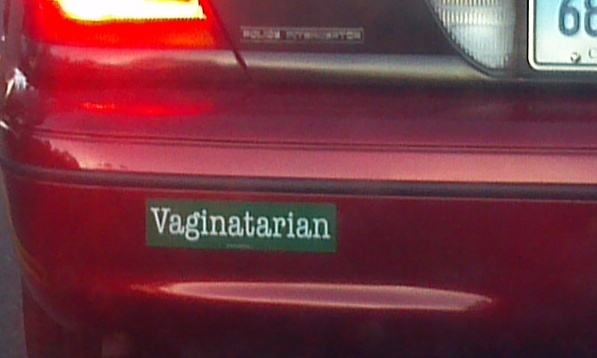 Then I took a second glance and realized that it didn’t say vegetarian, but rather vaginaterian. WTF does that even mean? First of all, its gross. Second of all, its freaking impossible. Anyways, that’s my little Friday thought…thought I’d share how ridiculous people can be. Posted on October 7, 2011, in Random Experiences, Ridiculous People, Road Rage. Bookmark the permalink. Leave a comment.